A beautifully well-crafted artwork has always been the first thing to catch the attention of my eyes and seduced my mind. It’s one of the first and most important impressions to me of a new act, which either strengthens my curiosity to begin digging in the holy ground of the band and unveil what treasure of music lies hidden beneath it or just to let it stay buried forever. 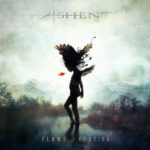 There is no exception to that rule with my latest acquaintance, the prog metal act called Ashent. The artwork created by Mario Sanchez Nevado is a haunting and stunning piece of art, and so I began digging…after many hours of hard work with sweat in my ear channels, a small polished prog pearl had revealed itself. View original.